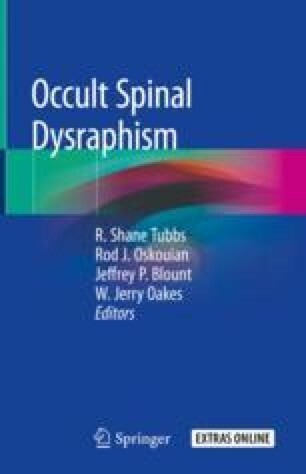 Many diagnoses may also have an associated form of the occult spinal dysraphisms. Many of these are uncommonly related, but some (e.g., anorectal atresia) are frequently seen in conjunction with an underlying spinal malformation. Each of these diagnoses should be investigated fully in order to minimize long-term consequences of an untreated or unrecognized tethered spinal cord. McCormick P, Kaiser M, Angevine P, Ogden A, Mandigo C, Lo L, Anderson R, Feldstein N. Tethered spinal cord – The Spine Hospital at The Neurological Institute of New York. [online] The Spine Hospital at The Neurological Institute of New York; 2017. Available at: http://columbiaspine.org/condition/tethered-spinal-cord/. Accessed 3 Jul 2017.